As our hometown magazine turns 10, we look back at where we’ve been and where we’re going. 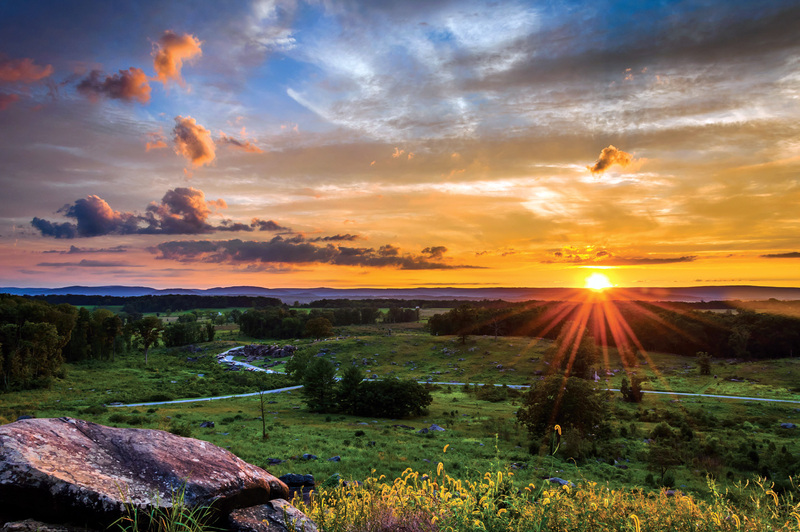 The bucolic, rolling hills surrounding the ‘most famous small town in America’ of Gettysburg are steeped in hundreds of years of rich history. According to the Adams County Historical Society (ACHS), Native Americans used the land known today as Adams County as a “thoroughfare and hunting ground,” though they admit no conclusive evidence of a Native-American settlement in this area exists. In the 1730s and 1740s, European settlers began arriving on American shores, spreading westward to carve out new lives far from their homelands of Ireland, England, and Germany. Gettysburg was founded in 1786 and named for Samuel Gettys, an early settler and tavern owner. Small but thriving industries cropped up, including carriage manufacturers, shoemakers, and tanneries. In 1800, the boundaries of present day Adams County were carved out of existing York County, and Gettysburg became the county seat of Adams County. The population of rural Adams County would grow to 28,006 by 1860, and residents would work primarily in farming or farming related occupations. Many Adams Countians enlisted at the beginning of the American Civil War in April 1861; over the course of the four-year war more than 3,000 residents had enlisted, according to ACHS. The lives of 2,400 residents and the future of our town were forever changed when the Civil War arrived at our doorstep. An aerial view of the town looks much like the hub of a wheel—10 roads all lead to the center of town, including U.S. Route 30 (Lincoln Highway), which was the nation’s first transcontinental highway. ‘All roads lead to Gettysburg’ and supplied several pathways for the Confederate Army of Northern Virginia and the Union Army of the Potomac to converge in late June of 1863. The first three days in July of 1863 saw more than 170,000 soldiers clashing in and around Gettysburg, leaving 40,000 soldiers dead, wounded, or missing in its wake. ftermath stunned our small town, which was suddenly thrust into the spotlight in American history books. The ACHS notes that on Aug. 15, 1863, prominent local businessman George Arnold (1799-1879) wrote to a friend that “our town has now become immortalized.” President Lincoln spoke at the dedication of the Soldiers’ National Cemetery on Nov. 19, 1863.
ficant event in American history. The idea of Celebrate Gettysburg came about when Jessica Dean, the magazine’s founder, publisher, and art director, realized her hometown lacked a lifestyle magazine geared specifically toward area residents. With her experience as art director at another regional publication and her love of Gettysburg—and all of Adams County—Celebrate Gettysburg was born. Gettysburg has undergone several notable advancements that have enhanced the visitor experience. “At ACHS, we have seen a number of new historical venues: a new museum and visitors center for the Gettysburg National Military Park, David Wills House, Gettysburg Seminary Ridge Museum, and Gettysburg Heritage Center,” says Benjamin Neely, ACHS executive director. Anniversary celebrations are both entertaining and informative. They promote good will and fraternalism, encourage enterprise and initiative, and create a just and pardonable pride in progress and achievement. The Gettysburg area had been preparing for the sesquicentennial of the Battle of Gettysburg for years, and was rewarded by a dramatic increase in visitor attendance. “Tourism has helped drive the economy in Adams County considerably, bringing in $671 million in 2013, much higher than 10 years prior,” says Whitehill. A revival of Gettysburg’s antiquity by way of new and inventive artifact displays and battle immersion breathes new life into stories that are centuries old. “Businesses in the tourism industry continue to adapt and find ways to tell their story better and in more relevant ways, and Gettysburg is creating an experience that visitors will continue to return for year after year, sustaining the vital economy that tourism now supports,” says Whitehill. ft. The revitalization of Steinwehr Avenue reinforced Gettysburg Borough as a hub for tourism. “That end of town has improved dramatically in appearance and quality of business. It took a perceived negative to inspire this positive change,” adds Boardman. The Steinwehr merchants were proactive. They’re doing a lot to take pride in an area that needed a facelift, and they’re working together. That sets the tone that maybe we can do that for the entire Gettysburg area. Our Gettysburg address marks our location both within history and on a map. The area’s longstanding focus on history and tourism has merged with an eclectic mix of local businesses and reinforces the diverse options available to residents and visitors alike. Just as in the town we feature, the anniversary of 10 years in publication caps a decade of learning, growth, and change. “In a world where there are so many things that are wrong, and negative headlines fill our inboxes, TVs, etc., we want to focus on the good and those things that make this area so special,” says Dean. We’d like to thank the community for being so supportive. We extend a special thanks to all of those who have been involved to make this idea a reality. We couldn’t have done it without you!